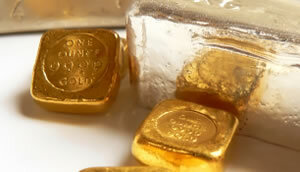 Precious metals futures on Wednesday rebounded from their prior-day losses. Palladium not only posted its eighth record close in nine sessions but it finished ahead of gold for the first time in about sixteen years. Gold for February delivery rose $5.40, or 0.4%, to end at $1,293.80 an ounce on the Comex division of the New York Mercantile Exchange. "The macro environment still looks very positive for gold, given we expect the dollar to weaken and the Fed unlikely to start hiking rates until the second half of the year," Reuters quoted Suki Cooper, precious metals analyst at Standard Chartered Bank. Gold futures ranged from a low of $1,287.60 to a high of $1,295.40. They shed 0.2% on Tuesday and rose 0.1% on Monday. Meanwhile, silver for March delivery added 1.8 cents, or 0.1%, to close at $15.638 an ounce. Silver futures traded between $15.52 and $15.69. They lost 0.4% on Tuesday and climbed 0.2% on Monday. April platinum gained $7.80, or 1%, to $807.90 an ounce, ranging from $800.20 to $810.10. Palladium for March delivery soared $41.40, or 3.2%, to settle at $1,318.50 an ounce — another new record. Palladium traded between $1,280.50 and $1,321.90. Gold declined $1.60, or 0.1%, to $1,292.80 an ounce. Silver declined 6 cents, or 0.4%, to $15.54 an ounce. United States Mint bullion sales increased by a combined 4,000 ounces in American Eagle and Buffalo gold coins and by 420,000 ounces in American Silver Eagles.